SICK has launched a configurable, plug-and-play 3D detection sensor based on its Visionary-T range of 3D imaging cameras, harnessing the imaging power of SICK’s single-snapshot Time-of–Flight (TOF) technology for a range of detection and collision warning duties. With on-board processing, the Visionary-T DT sensor can be easily configured for a variety of applications to detect the presence or absence of 3D objects. It therefore offers a versatile, entry-level option for collision warning on forklifts, Automated Guided Vehicles (AGVs) and Carts (AGCs). 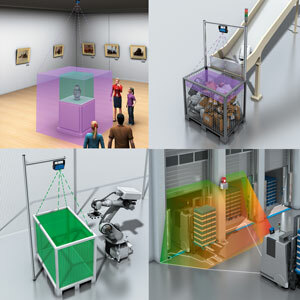 Tasks that were previously difficult to achieve with a fixed camera are now quickly and easily accomplished by the Visionary-T DT, for example to detect whether a bin, tote or stillage is completely empty, part full, or overloaded. The sensor provides 3D image analysis with a simple yes/no, occupied or unoccupied, signal depending on the configuration. A discrete output signal enables easy integration with an automated system. Direct communication capability can be set up to a visual display, an acoustic alarm or a PC, and to enable activity recording for later appraisal of any incidents. The Visionary-T DT can assess the availability of a workstation or cell on a production line where a large object, such as a vehicle or other machinery assembly, is to be moved for the next phase and warn of any intrusions. “The SICK Visionary-T DT allows users to integrate 3D vision into automated systems without the need to process raw data or to perform complex programming,” explains Neil Sandhu, SICK’s National Product Manager for Imaging, Measurement, Ranging and Systems. “It therefore opens up opportunities both for manufacturers of unmanned vehicles, machine builders and OEM production engineers to easily achieve 3D detection tasks that were previously challenging to set up with a fixed camera. For example, knowing whether a bin, tote or stillage is completely empty, part full, or has similar parts in stacked layers, has often been difficult to check without moving the camera, or the bin and objects. SICK’s Visionary-T imaging sensors capture high-resolution real-time 3D images with one shot of light, dispensing with the need to profile a moving object through laser triangulation. The SICK single-snapshot technology does not need movement to create the depth of field and object resolution required for high-performance 3D detection. The Visionary-T DT can be configured using a PC, SICK’s SOPAS software tool and a purpose-designed Graphical User Interface. 3D objects or detection zones can be taught from the camera without the need for complex programming. The IP67-rated SICK Visionary-T DT is designed for 24/7 industrial use in rugged conditions. With a sensing area range of up to 50 by 45 metres at 40 metres distance, the SICK Visionary-T DT provides excellent area coverage around objects and machinery. The powerful light burst illuminates even matt and dark coloured objects, and the adjustable filters allow application-specific optimisation for enhanced detection quality.